In Theater Screenings of Cheech and Chong's Animated Movie! Here is the current list of movie theaters that will be screening Cheech and Chong's Animated Movie! We'll keep adding to this list as we receive more locations. Willie Nelson, Whoopi, George Lopez, Wiz Khalifa and Bill Maher will be in the animated video for the new Cheech and Chong song WEed are the World. The song is, of course, a spoof on the 80s classic We are the World and is off the soundtrack for Cheech and Chong's Animated Movie! The video for WEed are the World will be released April 15th. Cheech and Chong's Animated Movie! Musical Soundtrack Album ships April 9th. Cheech and Chong's Animated Movie! ships April 23rd. The movie and soundtrack are available for pre-order now. 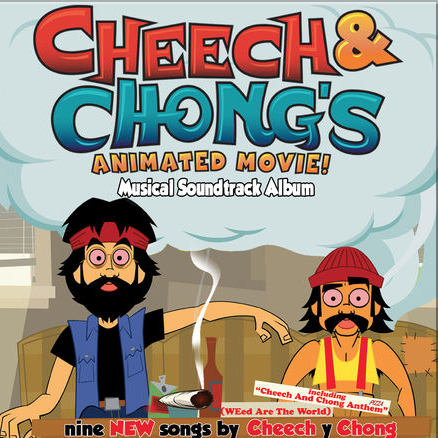 Everyone’s favorite stoner duo are back - and animated - in CHEECH AND CHONG’S ANIMATED MOVIE!. And what's a great movie without a great soundtrack. 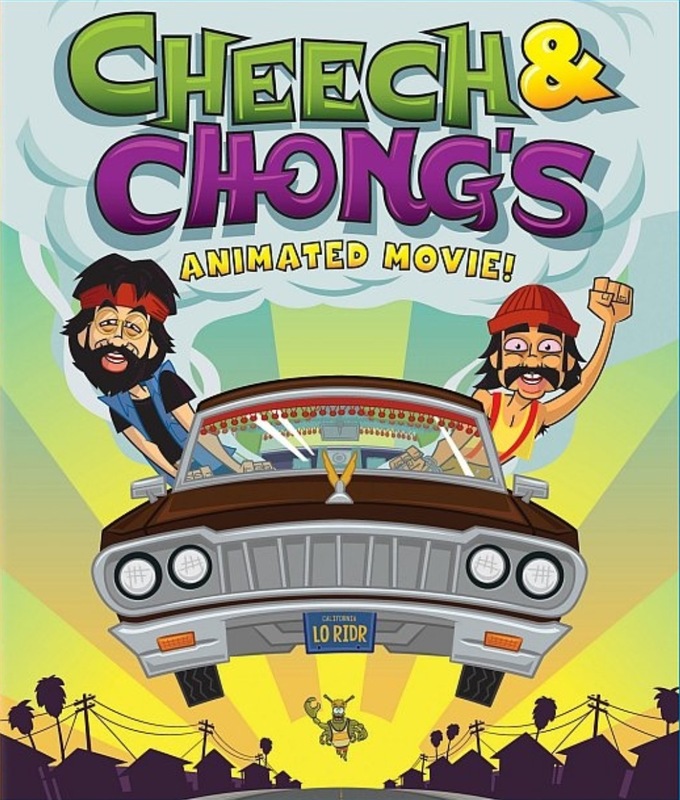 You can pre-order Cheech and Chong's Animated Movie! Musical Soundtrack Album now from iTunes. CHEECH AND CHONG’S ANIMATED MOVIE! showcases the legendary toker jokers like you've never seen them before – in animation. Catch the buzz as their most outrageous routines and laugh-out-loud lines from their ground breaking Grammy Award-winning albums come to life, including the original Ode recordings of "Dave's not here,” “Let's make a dope deal" and more. With help from a bud-lovin' body crab named Buster, Cheech & Chong “the masters of the smokin’ word” deliver the ultimate comedy high and give you the munchies for more. In celebration of 420, CHEECH AND CHONG’S ANIMATED MOVIE! will be featured on the big screen in a limited theatrical engagement. Details and theater listings will be announced in the coming weeks. We've been looking forward to this movie for years and it will finally launch April 23rd. You can pre-order it now from iTunes. On May 25th, the Cheech and Chong - WAR - Tower of Power 'Hot Summer Nights - Up in Smoke' comedy tour is comedy to the Greek Theatre in Los Angeles, California. The pre-sale is this Friday at 10AM local time via the ticket link at the top of the page. On May 26th, the Cheech and Chong - WAR - Tower of Power show is coming to Tucson, Arizona. The on sale date hasn't been announced yet, but will be available via the Casino Del Sol website. Two great bands of the 70's come together for the "Hot Summer Nights -- Up in Smoke" concert, featuring War, Tower of Power and Cheech and Chong! The legendary multi-platinum band War defined early-70s popular music, fusing together rock, funk, jazz, Latin, R&B and even reggae into a string of hit singles and acclaimed albums. Tower of Power has been creating their own kind of soul music. Since 1968, Tower of Power has delivered their unique brand of music to their fans, appearing before sold-out crowds as they tour the world each year. Tower's sound can be hard to categorize, but the band's leader and founding member, Emilio Castillo, has labeled their sound as "Urban Soul Music." 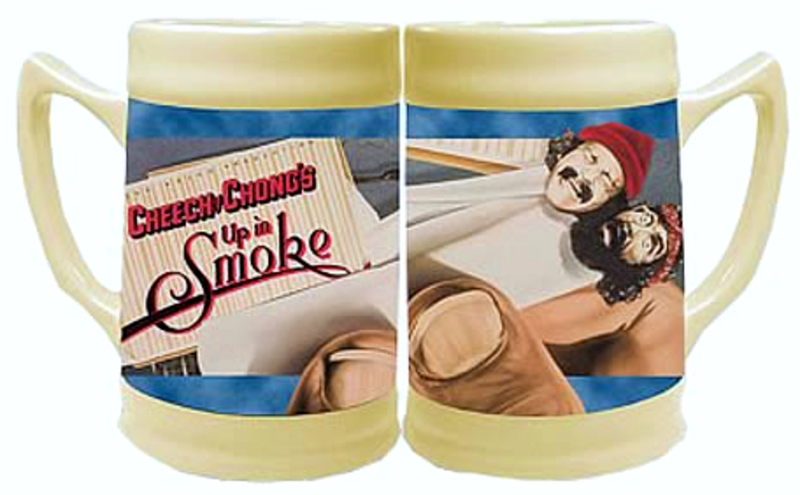 Cheech Marin and Tommy Chong had early success with the release of their first feature-length movie, "Up in Smoke" in 1978. The movie became something of a cult classic and was successful enough to warrant a sequel. Now the comic duo has teamed up for "Hot Summer Nights -- Up in Smoke" a comedy show / concert featuring music by WAR and Tower of Power, as heard in the 1978 feature-length movie, "Up in Smoke." These awesome steins were released in 2003. A few years ago, we thought they had sold out. Good news! This week, more cases were found in the corner of the warehouse. This is the remaining inventory. Once they're gone, they're gone, forever. Cheech and Tommy aren't getting any younger so they are likely to increase in value. Order now before they sell out. And as always, FREE shipping and handling on everything within the US. On August 23rd, the Cheech and Chong - WAR - Tower of Power show is coming to Atlanta, Georgia. The on sale date hasn't been announced yet, but will be available via the ticket link above. On this week's episode of The Chong and Chong Show, Tommy Chong says he was asked to audition for ABC-TV's Dancing with the Stars. Tommy, who has taken professional dance lessons with his wife Shelby, actually went down there and auditioned. Tommy said he was convinced they'd select him because he can dance. After watching the show, he realized that Dancing with the Stars doesn't want people that can dance, they want people they can goof on. Hopefully, they'll give him another chance. TMZ asked Tommy Chong who he's always wanted to smoke with, but never has. Paul is the only Beatle he hasn't smoked with. Tickets go on sale Friday, March 22nd at 10am local time via the ticket link above. As previously announced, Hot 92.3 is presenting the Cheech and Chong - WAR - Tower of Power show May 25th at the Greek Theatre in Los Angeles, California. This sounds like an awesome show. Tickets go on sale Friday, March 29th at 10am local time via the ticket link above. FOUNTAIN VALLEY, Calif., March 13, 2013 (GLOBE NEWSWIRE) -- MEDL Mobile, Inc. (MEDL) -- a pioneer in the creation, development, marketing and monetization of mobile apps announced today that it won a total of eleven awards at the Orange County ADDY awards which celebrate creativity and excellence in advertising and marketing. The company took home five Gold Awards for their apps Real Recipes, Live Hotspot NYC, Cheech & Chong's Fatty Comedy App - a Mobile Dispensary of Fun - MEDL MOBILE, and My Wild Night With Ted; five Silver Awards for Santa Bomb, Marlee Signs, Kids! Learn to Draw, Journey to Real Madrid, and Uncle Sarah; one Bronze Award for Tyzen The Hypnotist. Additionally, MEDL won a special Judges Award for its viral video created to promote the company's app, Boink. " It was a great night," said Dave Swartz, MEDL President and CCO. "We were founded on the belief that apps are the perfect medium for any company looking to connect with an audience. It's wonderful to be recognized by our peers for excellence in doing so." MEDL app development clients include other notable Orange County companies such as Taco Bell, Verizon Wireless and Hyundai Motor America. MEDL Mobile continues to expand its library of more than 150 high caliber apps with other great brands such as Taco Bell, Verizon Wireless, Hyundai Motor America and many others. MEDL Mobile looks forward to returning to the 2014 OC Addy Awards gala to showcase their stellar work in the mobile arena. On HuffPost Live today, Cheech announced that Cheech and Chong will be launching a summer tour with the bands War and Tower of Power. Coincidentally, during this week's Chong and Chong podcast, Tommy revealed that their tour manager, Jimmy Root, came up with the idea of using War's Low Rider song during their act. Cheech and Tommy told Jimmy they needed a song to play during the low rider sketch and he came up with Low Rider. Tommy also said that they videotaped every show so Jimmy knew when to play the sound effects. Sadly, they'd overwrite the tape each night. The only tape that exists is Cheech and Chong Perform. It's a bootleg that a club owner recorded. The tour will take place this summer only, in open air venues. The first date of the WAR / Tower of Power / Cheech & Chong tour will be May 25 at the Greek Theatre in Los Angeles, CA. On sale date has yet to be announced. This evening, Cheech Marin was on HuffPost Live. It was a super-interesting interview. Cheech also revealed he's working on a book about immigration called We Come in Peace and We Have you Surrounded. Marin's voice was hoarse because he just wrapped up doing a voiceover for a Mexican animated film titled El Americano. It's about birds flying to American to join the circus. Cheech plays the bad guy. It will be released later this year. So this means Cheech will have two animated releases this year. El Americano and the previously announced Cheech and Chong's Animated Movie. Cheech says the one thing that he and Tommy Chong would like to achieve is being inducted into the Rock N Roll Hall of Fame. He says people often ask him why a comedy duo should be inducted. His response is that many rock bands cover their songs. Side Note: Producer, Lou Adler, had a sticker on their albums which said Hard Rock Comedy. Cheech and Tommy will be inducting Lou Adler into the Rock N Roll Hall of Fame next month. AV Club asked legendary actor, Stacy Keach (Mike Hammer, Sgt Stedenko), what it was like working with Cheech and Chong in Up in Smoke and Nice Dreams. Sgt. Stedenko was definitely one of my favorite characters. I loved working with Cheech and Chong, and we had a lot of fun. Everyone thinks that everyone was stoned on the set, but that’s not true at all. Everybody was straight as an arrow when we were working. After work… well, who knows what goes on? [Laughs.] But on the set, they were absolutely very professional and were hard workers. We had a great time. LOS ANGELES, CA (March 8, 2013) – Everyone’s favorite stoner duo are back - and animated - in CHEECH & CHONG’S ANIMATED MOVIE, rolling its way into Blu-ray and DVD April 23 from Twentieth Century Fox Home Entertainment. Directed by Branden and Eric D. Chambers, this high-larious feature-length adventure is the perfect film to watch at home with your best buds! CHEECH & CHONG’S ANIMATED MOVIE showcases the legendary toker jokers like you've never seen them before – in animation. Catch the buzz as their most outrageous routines and laugh-out-loud lines from their ground breaking Grammy Award-winning albums come to life, including the original Ode recordings of "Dave's not here,” “Let's make a dope deal" and more. In celebration of 420, CHEECH & CHONG’S ANIMATED MOVIE will be featured on the big screen in a limited theatrical engagement. Details and theater listings will be announced in the coming weeks. The CHEECH & CHONG’S ANIMATED MOVIE Blu-ray and DVD is loaded with bonus material including joint commentary from Cheech Marin and Tommy Chong, as well as commentary by the directors and producer Lou Adler, taking fans inside the minds of the duo that’s been making audiences laugh for generations. Note from the Weedmaster: Yeah, I'm also wondering why Tommy's son, Paris Chong, is doing commentary. If you listen to their podcast, The Chong and Chong Show, he's constantly mispronouncing words and using words improperly. Plus, he has nothing to do with the history of Cheech and Chong. 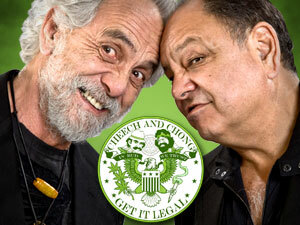 On April 21st, the Cheech and Chong: Get it Legal tour is coming to Mount Clemens, Michigan. Tickets go on sale Monday, March 11th at 10am local time via the Ticketmaster link above. These masterpieces were released in 2003. They sold like lids. We couldn't keep them in stock. 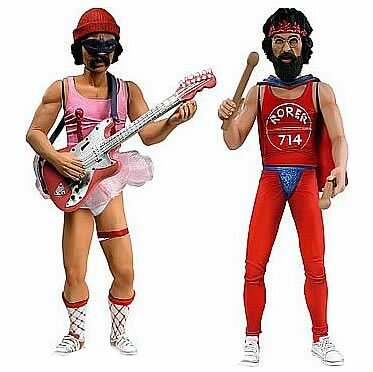 It was our best selling Cheech and Chong toy ever. Record Store Day 2013 takes place April 20th at record stores all over the US of A. Speaking of 420, record stores will be selling a super limited edition Cheech & Chong 7" LP. Side one has Earache My Eye. Side two has Turn that Thing Down. Essentially, it's the same 7 inch released by Ode Records in the 1970s, but this one is super cool green vinyl.